Rev. Dr. Ross Lockhart, director of Presbyterian formation at St. Andrew’s Hall, was key in sponsoring ReImagine Vancouver – and his new book expresses some of his hopes (and fears) for his spiritual but not religious Vancouver neighbours. 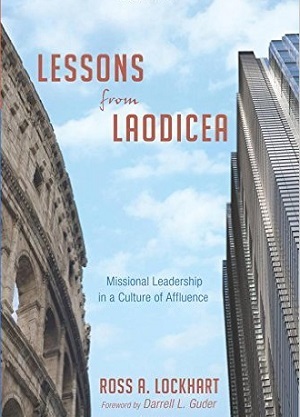 Following is an excerpt from Lessons from Laodicea: Missional Leadership in a Culture of Affluence. It is re-posted by permission. “Oh, just fine, thank you,” she said casually. “I do miss the days of Rev. (insert Christendom-loving minister with an ‘old country’ accent here) when the church was full.” I nodded and she continued, “Oh, how I loved his preaching. He used to tell the best fireside stories each Sunday without mentioning the Bible – and he got away with it! Isn’t that wonderful?” she said with a cackle. She frowned and walked away. in a post-Christendom North America, Christ followers encounter people of no expressed belief and all kinds of different beliefs every day. The interactions we have with others as apologists can range from angry atheists to the affable agnostics to the amiable apathetic folks whose Sunday ritual includes visiting Starbucks and reading The New York Times religiously. Rather than understanding the church as the sent people of God, as missionary disciples who are deployed to bless and mend God’s broken world as witnesses to resurrection power, too often we have encouraged and enabled an entitlement mentality regarding membership in the church. This lingering postwar, 1950s model of membership church that existed primarily to meet the needs of those consumers in the pews rather than those outside the walls of the church, is an ongoing obstacle to missional practice in the mainline church. This membership model all too often “outsources its baptismal vows” to paid clergy and feels that showing up through “noses and nickels” is all that is required. For some, church simply becomes a performance they attend. If it no longer suits their personal desires, then they move on to another performance. In the movement from a parish-based approach to church to the commuter model or “voluntary society,” people pass many mission communities on their way to a “church of their choice” each week. This “consumerist” model of Christianity certainly mirrors the consumerist culture of North America where people use their freedom to flow easily from one service provider or product to another based on their personal preference or the most desirable price. What could be better than a low-cost (to you), high-attraction church for many people? The freedom to move between churches based on personal preference has become an assumed fact of Christian lifestyle in North America today. The Art of Neighboring, a wonderful book by Jay Pathak and Dave Runyon, is a helpful addition to missional literature. To test one’s engagement with their neighbours, the authors developed a chart to help move the Great Commandment from a theory into a real-world context by having people identify eight “neighbours” around their home or apartment. The first step is simple. Can you write the names of the people who live in the homes around you? Even writing first names only is acceptable. The second step is to write down relevant information about the people who live in the eight homes around you that you could not tell by simply seeing them in the driveway or apartment hallway. For example, write down where they are from and what kind of work they do. Third, write down in-depth information that might include a sense of their dreams and goals and purpose for life. Based on your conversations with them, what do they believe and according to what values do they live their lives? In sharing this exercise with church people, Pathak and Runyon have discovered that about 10 percent of people can fill out the names of all eight neighbours, three percent can fill out the second question for everyone and only one percent can fill out the deeper third question for each home. Two local mission communities helped me recently understand what it looks like to be a people gathered around worship, witness and work. University Presbyterian in Seattle is known for its effective and faithful ministry in the Pacific Northwest. Several years ago, the elders of the congregation felt God calling them to plant a new mission community. They were called to purchase a warehouse in the South Lake Union neighbourhood of Seattle. Urban planners in the congregation told the session that this was the next up-and-coming neighbourhood in the city. The church commissioned its well-loved youth and young adult ministers, James B. and Renee Notkin, to minister in that community. The Notkins established a coffee shop and set to work on building relationships in the community. Like the Apostle Paul, James B. had a varied skill set that included business and theology. His tent-making skills helped establish a thriving coffee shop in one-third of the building and a gathering space for worship, witness and work in the remaining two-thirds of the space. In time, the urban planners were proved right as Amazon established its world headquarters in South Lake Union – and the place came alive. Soon “Union Church” as it was called became the hottest non-profit space in a growing neighbourhood of young executives living in loft apartments or shiny new condo towers. James B. varies the Sunday gathering with a mix of worship, witness and work. Some Sundays, people gather for an uplifting worship service of praise. Other Sundays, a brief worship turns into a Bible study with small groups where people do the heavy lifting of scripture together. Still other Sundays, a brief worship is followed by an invitation for disciples to sign up for one of several activities of service in the community that morning – everything from cleaning up trash to making sandwiches at the local homeless shelter to visiting in a nearby nursing home. James B. has told me that several people have come into a relationship with Christ who were suspicious of Christians but came at first on the Sundays where they could serve in the community. We’ve adopted this format for our own chapel services where I teach at the University of British Columbia. Missional worship terrifies and electrifies students and faculty alike as we go forth from St. Andrew’s Hall to serve and witness to God’s glory on campus. Another mission community that has encouraged me lately is St. Peter’s Fireside, Vancouver. A new mission community, it is an outreach in the downtown to so many who live in the skyscraper condos, yet who describe isolation from neighbours as one of the biggest obstacles to urban living. In fact, Vancouver is home to an incredible number of church plants – missional leaders who are trying to figure out what God is up to in a community with so many pre-Christians that presenting the gospel here feels a lot like standing on Mars Hill with Paul in Acts 17. The mission community uses excellent online tools to engage with their young, wired congregation. Participation in a mission community like this leaves no room for spectators or those who have settled for consumerist religion with its “outsourcing of baptismal vows” to paid clergy. Spending time in mission communities like Union Church or St. Peter’s Fireside makes me hopeful and excited for what the Holy Spirit is doing in our midst. Perhaps the most exciting part of these new and renewed mission communities emerging in our post-Christendom context is that there is less and less room for folks who want to observe the “Sunday show” or take out the membership but never exercise on the ecclesiastical elliptical machine or the sanctified spin bike. In a culture of affluence there will always be a seductive pull towards the unholy worship of me, myself, and I. For those daring enough to respond to God’s call and serve as missional leaders, advice from the Old Testament like “gird your loins” comes to mind. Missional leaders are sent into a culture of affluence to speak up and speak out against the demonizing lure of self-worship with joyful praise of the Triune God. Missional leadership confesses, “I’m (not) sorry” as it stirs up Christian apologetics (defense of the faith) for apologetic Christians, who are sent forth to counter the consumerist mindset with a confession of faith in the living God. This proclamation, however, is not of the doom and gloom variety. No, we proclaim God’s grace and goodness against the powers and principalities of this world knowing that in the cross of Christ, God’s victory has already been achieved over sin and death. Our turn from self-worship (which ultimately ends in self-loathing) to the genuine praise of the Triune God is a movement full of joy and thanksgiving. Ross A. Lockhart is associate professor at St. Andrew’s Hall. 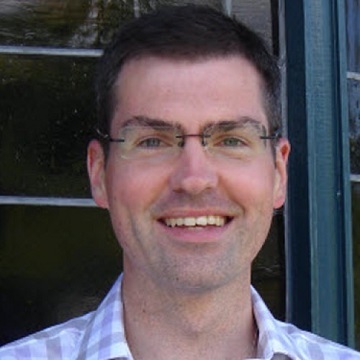 He is the founding director of the Centre for Missional Leadership and author of Gen X, Y Faith? (2002) and coeditor of Three Ways of Grace (2009). “I’m rich and I don’t need a thing” bragged the early Christians in the big city of Laodicea. The Apostle John, however, saw their affluence and arrogance through a theological lens. He declared them to be bankrupt, “lukewarm Christians” whom God would gladly gargle and spit out. Today, the mainline church in the West finds itself in a dominant culture of Laodicean affluence, where even faith is a commodity to be consumed. While the gospel spreads and thrives in the global South and East, the Western mainline church looks longingly back at Christendom and forward in fear. As Christians living in a North American culture that highly prizes the unholy Trinity of individualism, consumerism, and secularism, we require a new kind of missional leadership to “pray” attention to what God is doing in the world around us. This book names the challenges and promises inherent in partnering with the Holy Spirit in order to offer missional leadership in a culture of affluence. It is about both living in Laodicea and leaving it behind. We are no longer in a Babylonian captivity but a Laodicean one. This work helps chart a course for Christians who long to let go of “country club religion” and instead belong to a community that helps equip missionary disciples, resistant to the dominant culture and resplendent in the love of our triune God. ReImagine Vancouver will feature the three authors of The New Parish: How Neighborhood Churches are Transforming Mission, Discipleship and Community: Dwight Friesen, Tim Soerens and Paul Sparks. Go here for more on the gathering, and here for more on The New Parish. ← Around Town: Cabinet of Canadians, lost $4,000 returned, Over 18 . . . This article kind of rocks my world a little bit. You cannot help but notice the Church is kind of a in a pickle and most Christians aren’t too jazzed to get to know their neighbours. How did we get here? That little bit of 1950s and Church memberships, wow! That is so interesting. Another interesting bit that I recently learned is how Anabaptism and the Battle of Munster were always rooted in the idea of dramatic separation from the world. I wonder too how Dutch Anabaptism (the Alliance, the MBs, the Baptists) have heavily influenced our idea of what Church should look like? Separation from the world – in that we have our own schools, etc. – but with the world in every other possible way (money, money, money). Great article. More of this! And more of how do we get here. Thank you.